CHANDIGARH: A painting is a window to the world of particular artist, an imagination that would seem incomplete if articulated in words. Ananta Mandal, an ex-alumnus of Government College of Art and Craft, Kolkata University, brought his youthful exuberance and wide-eyed optimism to the city, reflecting in his paintings. Mandal's many awards received across the world for his art work include Best of Show award by Western Federation of Watercolor Society, Utah, USA and Merit Award at the 32nd International Exhibition at Watercolor Art Society, Houston, USA. This is the first time his work, focused on Mandal's journey throughout India, will be exhibited at Sector 9 in the city. Titled "The Journey", the exhibition includes paintings that focus on Indian folk. Mandal's paintbrush has captured city roads, countryside and blue skies merging with the horizon, which seem to create a subtle poetic image. 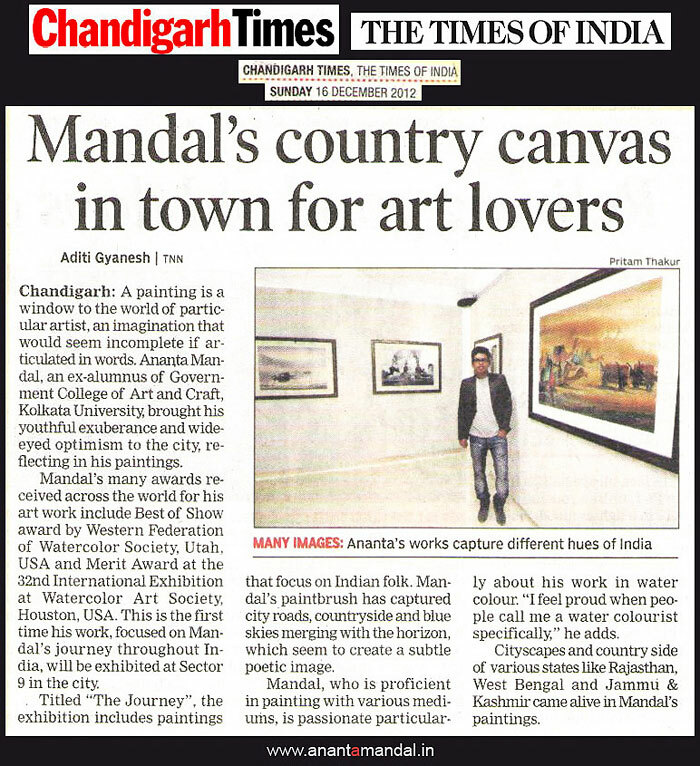 Mandal, who is proficient in painting with various mediums, is passionate particularly about his work in water colour. "I feel proud when people call me a water colourist specifically," he adds. Cityscapes and country side of various states like Rajasthan, West Bengal and Jammu & Kashmir came alive in Mandal's paintings.